China's most populous city, with some 18 million residents, Shanghai is also among China's most modern and cosmopolitan cities. Along the Huangpu River's West bank [Puxing] lies The Bund, Shanghai's historical financial center, with many buildings dating from the late 19th and early 20th centuries lining a one-mile stretch of the river. Behind The Bund, as well as along the East bank of the river [Pudong] now stand many skyscrapers containing offices, hotel rooms, and residences. Shanghai is an interesting mix of older temples, colonial-era buildings, and ultra-modern skyscrapers. 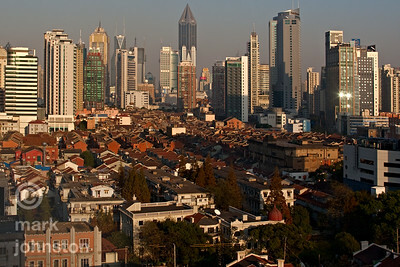 Shanghai skyline looking roughly east, over the rooftops of buildings of an earlier generation. In the center, the pointed gray building is Sunjoy Tomorrow Square [285 m high, 58 floors], completed after seven years of construction in 2003. The upper floors contain the highest private apartments in Shanghai. Just to its left, the curved silver and blue Raffles Square building [222 m high]. Further north (left) the tilted triangular face of the Shimao International Plaza building [completed 2004,roof height 246.5m], and the tan-colored Nan Zheng office building. To the south (right), the dark gray edifice of the Four Seasons Hotel [built 2002, 172m high]. 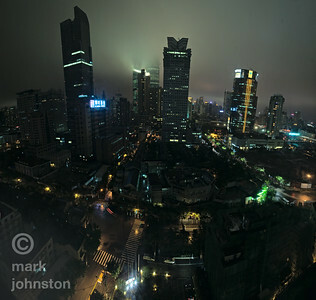 A foggy evening settles over Shanghai. Looking east, with Kerry Center at right across Nanjing Rd., and Dong Hai Plaza at center. 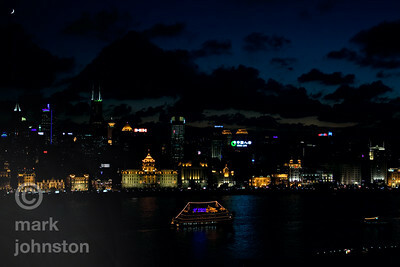 An illuminated river cruise boat passes along the Huangpu River in central Shanghai. 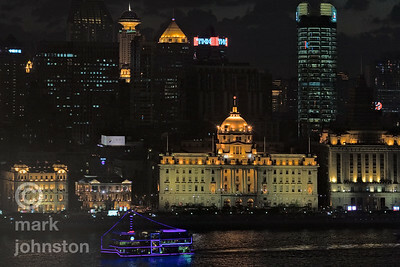 Buildings along the waterfront include [from left]: The Great Northern Telegraph Building, The China Merchants Company Building, the domed Hong Kong and Shanghai Banking Corporation [HSBC] Building, and the Shanghai Customs House. 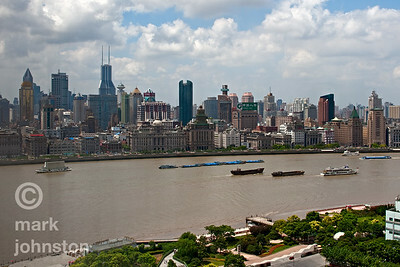 A panoramic view of Shanghai's Huangpu River and The Bund, looking west from the Pudong side. The old buildings along The Bund visible in this image include [from left to right]: part of The Union Building, The NKK Building, The Russell & Co. Building, The Great Northern Telegraph Company Building, The China Merchants Company Building, The Hong Kong and Shanghai Bank [HSBC] Building, [directly behind the boat] The Customs House, The Bank of Communications Building, The Russo-Chinese Bank, The Bank of Taiwan, the North China Daily News Building, The Chartered Bank of India, Australia, and China, The Palace Hotel, The Peace Hotel, The Bank of China, and part of The Yokohama Specie Bank. 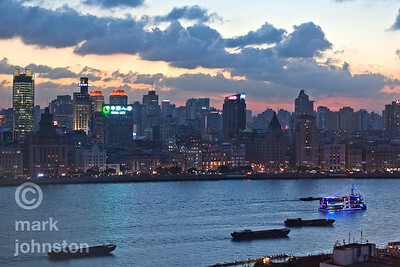 Dusk settles along Shanghai's Bund and the Huangpu River. Buildings along the waterfront include [left to right]: part of The Hong Kong and Shanghai Bank [HSBC] Building, The Customs House, The Bank of Communications Building, The Russo-Chinese Bank, The Bank of Taiwan, the North China Daily News Building, The Chartered Bank of India, Australia, and China [most brightly lit], The Palace Hotel, The Peace Hotel, The Bank of China, and part of The Yokohama Specie Bank, The Yangtze Insurance Association Building, and the EWO Building. Some of Shanghai's tallest buildings as a backdrop to the Bund from the Pudong side of the Huangpu River facing east, including the pointed Tomorrow Square building, and the twin antennae on the Shimao International Plaza building. 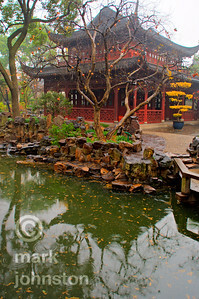 Yuyuan Garden, in the center of the old city of Shanghai, near Chenghuangmiao in Shanghai, was built over a 20-year period by the son of an aging official in the Ming Dynasty, to please his father. Eventually the gardens fell into disrepair, but they were restored by the Shanghai government between 1956 and 1961 and opened to the public. They were declared a national monument in 1982. 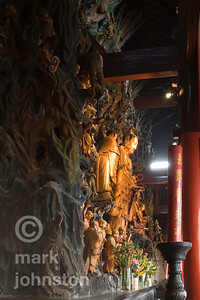 The Jade Buddha Temple [Chinese: 玉佛禅寺] is located in northwest Shanghai, China. 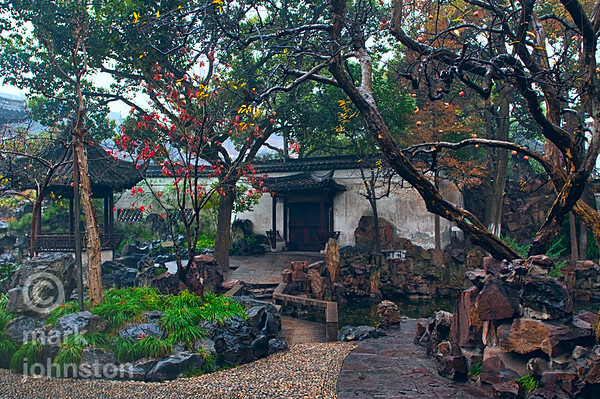 It was founded in 1882 when two jade Buddha statues from Burma were brought to Shanghai by a monk named Huigen. One of the statues was a 2-meter tall sitting Buddha, the other a smaller reclining Buddha. The temple now also contains a much larger reclining marble Buddha brought from Singapore by the tenth abbott of the temple in 1989. 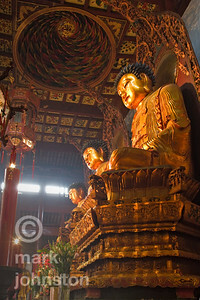 This photo is of the three golden Buddhas. The central figure is of Gautama Buddha, the left of Amitabha and the right of Bhaisajyaguru. The Jade Buddha Temple [Chinese: 玉佛禅寺], located in northwest Shanghai, China, was founded in 1882 when two jade Buddha statues from Burma were brought to Shanghai by a monk named Huigen. The smaller statue is of reclining Buddha, the other is a 2-meter tall sitting Buddha. The temple now also contains a much larger reclining marble Buddha brought from Singapore by the tenth abbott of the temple in 1989. 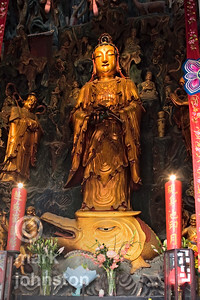 At the northern entrance to the Great Hall stands a golden statue of Guanyin, generally known in the West as "the goddess of mercy", as she is the bodhisattva associated with compassion. The name Guanyin is short for Guanshi'yin [觀世音] which means "Observing the Sounds (or Cries) of the World". She is called Kwannon/Kannon in Japan. She is accompanied here by Shen Cai and his 53 teachers. 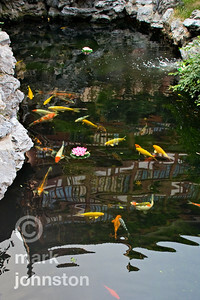 Reflection of a temple building in a fish pond at the Jade Buddha Temple, Shanghai, China. I got this remarkable shot shortly after take-off from Shanghai's Hongqiao airport, which serves a lot of the domestic air traffic in and out of Shanghai. 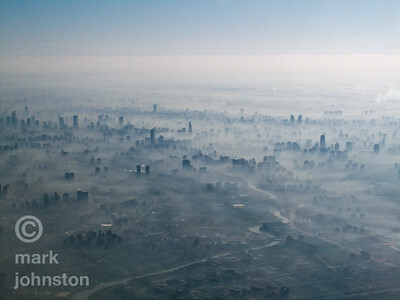 A combination of still air, clouds, and city smog gives makes for a surreal and ghostly cityscape.